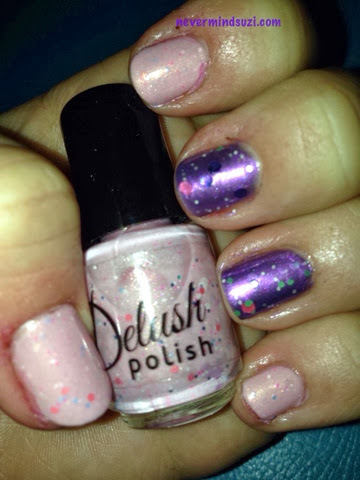 2 Delush Beauties today in a skittle type mani. Honey Pie Sugar Bunch is a gorgeous soft pink with delicate glitters throughout. Heart Shaped Box (as named by my lovely friend Vicki Q) is a metallic purple with green, red, silver and purple glitters and hexes. Both of them are simply stunning! !